I'm taking a break from the Tournament for a moment to bring you a few updates. 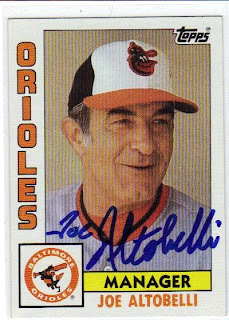 An autographed card of Orioles Manager Joe Altobelli. 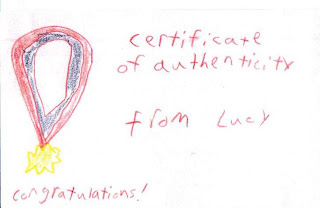 But, I have to say the actual PRIZE was the "Certificate of Authenticity" included with the auto'd card!! Kevin Wickander, Cliff Lee (who has a LOT to be smiling about!) and Alex Cole are all wearing their very happy faces! 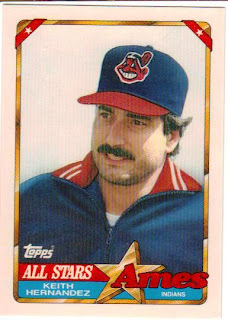 Here is a Keith Hernandez Ames card from 1990. Carmen Castillo and Sammy Stewart are wearing smiles! And, Sammy even gives out a "Thumbs-up!" 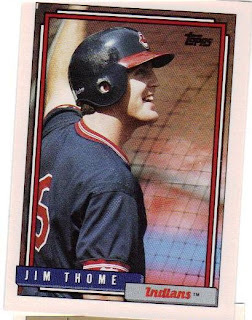 And, last but no where near least is a player I have loved to watch play from the very beginning (which this card is from those days, by the way) - Jim Thome, who is smiling and will continue to do so for many, many seasons after this picture was taken! THANK YOU so much, Lucy and Patricia! I've already been showing off my COA and can't wait to show it off some more on Saturday!! I have also received packages from several trades that I'm doing as well! I received about 150 Tribe Cards from Eric in Iowa that included a GU and a Serial# card! He'll be getting a box full of Yankees in return! 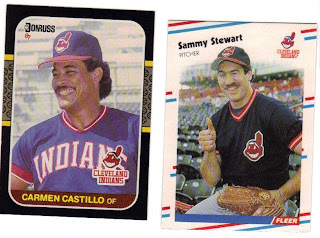 I sent a bunch of 1987 Topps cards to Cliff, and am working on 1981 Topps for Ben (not Ben Henry, another Ben)! I also received a stack of Tribe cards from another trader, but I lost the envelope the cards came in! AUGH! I can say the stack included a 1988-2008 Upper Deck hobby preview card in "Tipton" condition. :-) I'll figure it out and get a stack of cards to you if I have not already done so! And, finally, my son bought a 'snack pack' that included Cracker Jacks, peanuts, crackers, and a pack of 2007 Topps Opening Day cards. He knows I'm a collector, so after he opened the pack, he gave it to me! How cool is that!? I'll post the contents of that pack on A-Pack-A-Day!